Rock legend, Lou Reed, seen here performing at a 2011 Jazz Foundation of America benefit, passed away on October 27, 2013, at 71, from complications following a liver transplant earlier this year. We'll miss you, Lou. 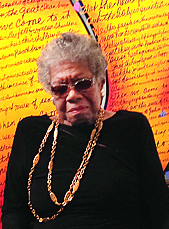 An Evening of Hand Written Poems Engraved and Painted on Glass at ACA Galleries featuring the collaborative works of Dr. Maya Angelou, and artists Carol Iselin and David Sugar. Donna Karan's Book "Stephan Weiss: Connecting The Dots"
Please contact us to obtain reprints of articles older than one year.